John Quincy Adams, the 6th President of the U.S., was also the defense attorney in the famous case of the slave rebellion on the Amistad. Like his father who was also a one-term president, John Quincy Adams was an intelligent statesman whose strong commitment to certain principles proved to be liabilities as president. For instance, Adams favored a bold economic role for the national government that was far ahead of public opinion. Like the Democratic-Republicans who preceded him in the Era of Good Feelings, Adams supported a federal role in economic development through the American System that was chiefly associated with Henry Clay. Adams' vision of federal leadership was especially creative and included proposals for a publicly-funded national university and government investment in scientific research and exploration. John Adams' wife Louisa was born outside of the United States. Adams' political enemies used this as fodder to accuse him of being pro-British. Few of Adams' ideas were put into action. He hurt his own case by publicly expressing concerns about the potential dangers of democracy. When politicians in Congress refused to act decisively for fear of displeasing the voters, Adams chided them that they seemed to "proclaim to the world that we are palsied by the will of our constituents." Although he astutely identified a problem faced by leaders in a democracy, to many Americans he seemed to call into question a central tenet of the new nation. In many respects Adams was a figure of an earlier political era. For example, he steadfastly refused to campaign for his own re-election because he felt that political office should be a matter of service and not a popularity contest. Although his ideals were surely honorable, when he said that, "if the country wants my services, she must ask for them," he appeared to be an elitist who disdained contact with ordinary people. 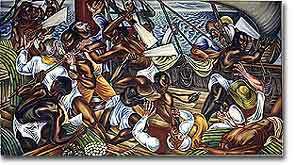 In Mutiny, Hale Woodruff captures the terrifying and heroic moment when enslaved Africans aboard the Amistad launch a rebellion against their captors. John Quincy Adams' public dedication to unpopular principles helped assure his defeat in the presidential election of 1828. They also led him to take on causes that today seem impressive. For example, Adams overturned a treaty signed by the Creek nation in 1825 that ceded its remaining land to the state of Georgia because he believed that it had been fraudulently obtained through coercive methods. Georgia's governor was outraged, but Adams believed that the matter clearly fell under federal jurisdiction. Although Adams' support of the Creeks didn't prevent their removal to the west, he lost political backing from Americans who widely believed that whites deserved access to all Indian lands. Adams continued this course of following principle rather than popularity when he served in the U.S. House of Representatives after his presidency. Although not a radical opponent of slavery himself, he was an early leader against congressional rules that prevented anti-slavery petitions from being presented to Congress. 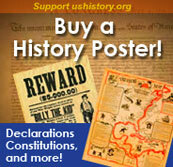 He also successfully defended enslaved Africans before the U.S. Supreme Court in the celebrated Amistad case. John Quincy Adams, a man dedicated to controversial issues throughout his Presidency, was the defense lawyer in this 1841 case. When 53 abducted Africans slavery were found in a Cuban slave ship off of the coast of New York, 3 groups tried to claim the Africans as property: Caribbean plantation owners, the captain of the Connecticut prison in which they were held, and the government of Spain. Click here to find out how the U.S. Supreme Court ruled. In a mutiny, 53 Africans killed all but 2 of the crew who abducted them from their homeland. This is the case of the Amistad, a Cuban slave ship recovered in U.S. waters in 1841. The transcripts of John Quincy Adams' defense of the Africans from being claimed as slaves makes for a somewhat long, but definitely interesting read. 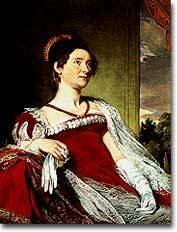 Anne Royall, the first professional journalist in the U.S., was consistently denied an interview by John Quincy Adams. So she made a journey to the Potomac River at 5 A.M., where she knew Adams regularly swam. Royall found his clothes on the bank of the river, sat on them, and waited for Adams' return, becoming the first female ever to interview a president. 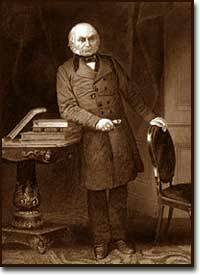 Click here to find out all about the biographical information on John Quincy Adams, as well as a few more quirks. Besides being a former President and Congressman whose policies influenced the history of the nation, John Quincy Adams was a pretty good writer as well. His book, Poems of Religion and Society, and was published just after his death in 1848. Click on the table of contents and start browsing through his book to find out just how good a wordsmith "Old Man Eloquent" really was. At age 73, John Quincy Adams argued for the freedom of the Amistad slaves before the Supreme Court — for a whopping eight and a half hours.